Both stars have worked together on past projects so it was no surprise that a full album would eventually follow up. This new album combines the true life stories of these two from their past experiences of falling in love, getting married all the way to getting a divorce. The album opens up with ‘Roller Coaster’ which tells the story of how much of a roller coaster ride you will endure in a relationship no matter how perfect it may seem on the outside. The track ‘Sweat’ is strictly for the grown folks who have ever been in an argument with their significant other, and somehow wants to ‘sweat’ it out in the bedroom. The leading single for the album, ‘Hurt You’ is what initially got me interested in this album. 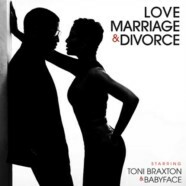 Although I have been a Braxton and Babyface fan since the 90’s, I was unsure of how the connection would work for this duo to do a full album, but the leading single changed my prospective. One of my favorite songs on this album is ‘I Wish’ in which Braxton carries this song alone. The singer brings out her inner emotions about her former love in which she wishes and hopes his new relationship fails. For a more romantic song, ‘Where Did We Go Wrong?’ is the song that will set the mood as it will help couples cope and figure out how to fight through the issue at hand. Although this album was released on Valentine’s Day, this album has the capacity to be played all season long as many couples will face ups and downs in their relationship, and this album will undoubtedly help ease any situation. Toni Braxton and Babyface truly concocted something together that no other artists in R&B have done just yet together. With the two incomparable voices together, this album takes you on a real life journey through love, marriage and divorce.